Our friend, Cinnamah-Brosia finds many of her recipes on Pinterest and cooking websites and blogs, but this one came from my own mother. Mom loved to cook. She was a great cook, and her dishes were definitely a gift of love to her family and friends. 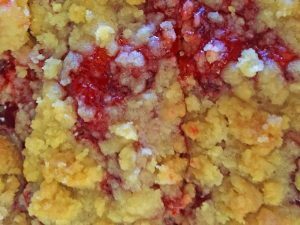 I’ve shared her Cherry Crumb Coffee Cake recipe with Cinnamah-Brosia, and it’s a Coffee Cottage favorite! Gradually stir in the dry ingredients until well-blended. Spread 2 21-ounce cans of Comstock (More Fruit Added) Cherry Pie Filling evenly over the batter. Place in mixing bowl and mix by mixer or by hand until you have a quite crumbly mix. Spread over the cherry pie filling. Cool, cut, and enjoy with a delightful cup of coffee! Note: My mom and dad owned a deli for a few years. The lunch crowd was great, but they offered many of their menu items prepared to go for parties and such. This was on the favorites list there, too. Mom often used Blueberry, Peach, Apple or other fruit pie fillings. The cherry was my childhood favorite and remains so today.